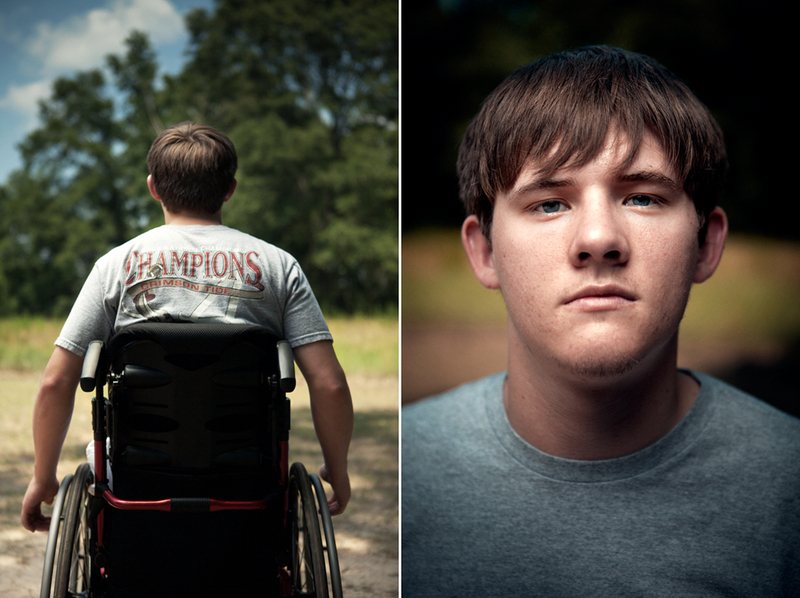 I recently had the opportunity to travel to Chatom, Alabama to photograph TJ Atchison for Technology Review Magazine. TJ has been in the news as late for being the first patient to undergo stem cell trials in the US; in his case, the trial is for spinal cord repair. I had the pleasure of hanging out with him and his family for a while and I was so encouraged to see such positive attitudes toward such "controversial" treatment, and even more excited that he's from Alabama. With the photo, I wanted to illustrate the idea of progress—both the progress he's already made, the progress to come for him personally, as well as what he, as a test subject, is for the progress of human stem cell treatment in general—and the support he gets from the doctors, his family, and his faith. The hand you see on his shoulder belongs to his mom, but to me it symbolizes the entire community of support surrounding him. Be sure to read the super informative article. Here's a shot that ran deeper in the article, as well as a portrait outtake.